Manny Ramirez was one of the most clutch hitters in the postseason and he anchored the Boston Red Sox offense as they captured two World Series titles. 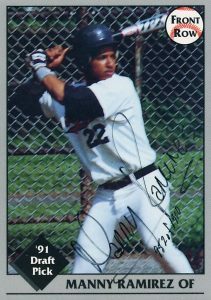 Debuting on major league cards in 1992, multiple Manny Ramirez rookies lead the way for collectors. As one of the premier sluggers of the 1990s and 2000s, his trading cards have always been popular and this list celebrates some of the best options from his playing days. 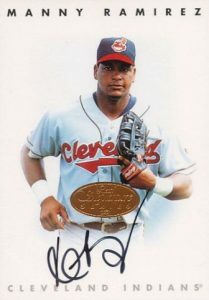 Ramirez officially debuted with the Cleveland Indians in 1993 and helped the team to a pair of World Series appearances. However, the legendary World Series victory by Ramirez's Boston Red Sox team in 2004 broke the 86-year championship drought and saw Manny named World Series MVP. In particular, his production in the playoffs was record-breaking with 29 postseason home runs and 78 RBI. Ramirez retired with a career .312 average along with 555 home runs. Shop for Manny Ramirez autograph cards on eBay. Manny Ramirez has multiple pre-rookie / minor league cards to choose from beyond those included below. Additional early releases can be found in 1991 Classic Draft Picks, 1991 ProCards Tomorrow's Heroes, and 1992 Classic Best Minor League. Given that his official rookie cards came in '92, there are also many other choices available to collectors, including 1992 Pinnacle, 1992 Score, and 1992 Upper Deck. While a card from 1992 Topps appears on the list, Topps also made a micro version that was 40% of the size compared to the standard issue. 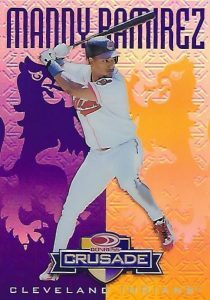 One of the most famous, or make that infamous, Manny Ramirez cards came in 2000 Pacific Invincible. This is because several of the bat relic cards attributed to Ramirez seemed to feature cork. Representatives from Pacific claimed that it was all completely genuine and the story would become part of the cloud of cheating that would follow Ramirez throughout his career. Former teammates David Ortiz and Ramirez were one of the best hitting combinations ever. As a result, they were frequently teamed together on autograph and relic cards. Collectors can find numerous examples in 2009 Upper Deck Premier, 2008 Upper Deck Sweet Spot, and 2008 Topps Triple Threads. Along with combination cards in '08 Triple Threads, Ortiz and Ramirez also share a triple relic with their New York Yankees rival Alex Rodriguez. Although Ramirez's home run prowess always made him popular with fans, his trouble with the league's substance abuse policy makes the road to Cooperstown very rocky. In picking out the best Manny Ramirez baseball cards, value was balanced with design in addition to an emphasis on his earlier card appearances. 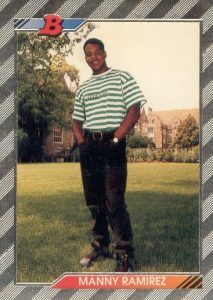 As you'll soon see, several of the key Manny Ramirez rookie cards feature him in non-traditional poses and clothes that are closer to a senior portrait than a traditional baseball card. 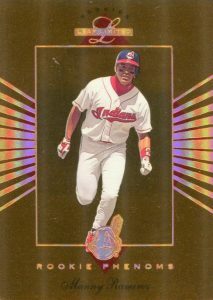 His 1992 Donruss The Rookies card is not one of those, however, as he strikes a hitter's pose in his Cleveland Indians uniform. The 1992 Donruss Rookies set was double the size of the previous year's edition. For a change of pace, the product was available through standard packs and not just as a complete set. Ramirez's rookie is the top card from the release. 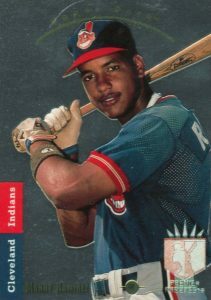 Although not technically considered a rookie card, Ramirez is placed in the Premier Prospects subset of the 1993 SP checklist. Each card features the Premier Prospects logo in the lower corner and prospects make up the final 20 cards of the set. The 1993 edition was the first SP set issued by Upper Deck. Although it is overshadowed by Derek Jeter's rookie, the Ramirez card remains popular. As many collectors know, the foil design can be easily damaged and chipped. 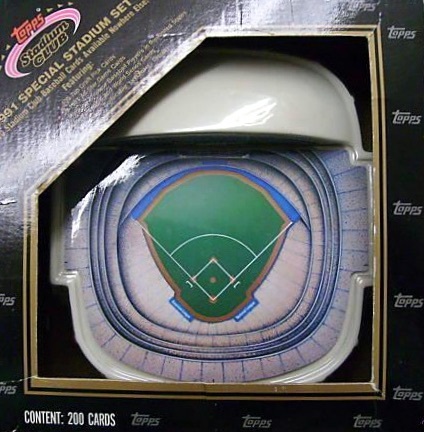 The 200-card factory release has become known as the SkyDome, or just Dome, set because it came packaged with a replica of the Toronto Blue Jays' new stadium. The 1992 Stadium Club Dome checklist is a collection of World Series highlight cards, Team USA players, and new draft picks. 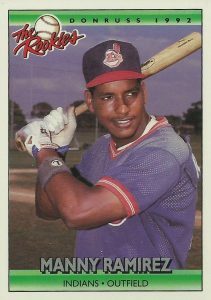 Ramirez is highlighted as the Indians' first-round pick in the 1991 Draft. He is shown on his card holding a baseball during a portrait session that you might have done at your local department store. Although noted as a 1991 product on the box and card, it is still treated by most collectors as a 1992 set based on a very late release. As a standout player his junior and senior years of high school, Ramirez was named the best prospect in New York City. He went straight from NYC's George Washington High School into the minors after the Indians drafted him. Soon after, a card company called Little Sun issued a set of high school stars who had been selected by major league teams. 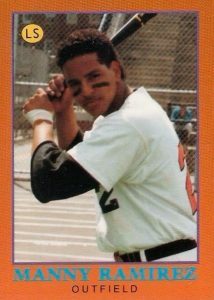 The 36-card, orange-bordered set includes one of Ramirez's first trading cards. 1994 Leaf Limited was the highest quality set that Donruss had ever released to that point. Using the same overall foil design, Leaf also issued a separate Rookies set that featured 80 top young players. This included 10 Rookie Phenoms cards with gold-foil backgrounds and 5,000 copies per subject. 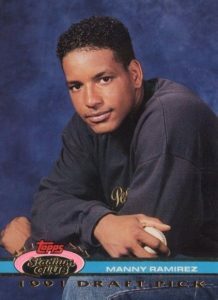 Although Ramirez's card is highly sought-after, it can't quite compete with the Alex Rodriguez rookie appearance. 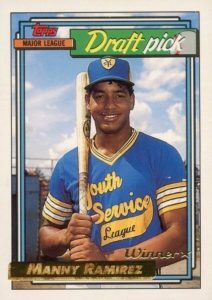 The 1991 Front Row Draft Picks set included 55 new selections and Ramirez was the top player featured. As luck would have it, Ramirez was also one of the few players that provided autographed cards for the set. He signed with black ink, often at a severe angle, as in the example below. It appears that Manny was also the person who hand-numbered each card as it is done with the same ink and penmanship style. For collectors who want to pull a Manny Ramirez Donruss Crusade card from a pack, they will need to track down boxes of 1998 Leaf as his was one of 30 Crusades inserted there. Ramirez's Crusade cards come in Green (#/250), Purple (#/100), and Red (#/25) versions with increasing scarcity. Other Crusade subjects could be found in 1998 Donruss, 1998 Donruss Update Series, and 1998 Leaf Rookies and Stars. Each card in 1992 Topps Baseball has two primary parallel versions. Of course, it's three if you include the previously mentioned micro version. The main Gold edition featured gold bars on the player's name and team. Collectors could also find contest cards in packs that if scratched off correctly could be redeemed for a pack of 10 cards stamped with "Winner." The Gold Winner cards have proven not quite as rare as many collectors suspected at first but it is still the key option to collect as there was no Tiffany version in 1992. Ramirez's autograph style changed significantly from the time of his earliest pre-rookie autographs (see #5 on this list) to his later cards in 1996 Leaf Signature Series. Each signature in the set features a gold, silver, or bronze stamp in the middle of the card and Manny was a short-printed signer. This means his autographs were cut dramatically to just 100 gold, 200 silver, and 700 bronze versions. 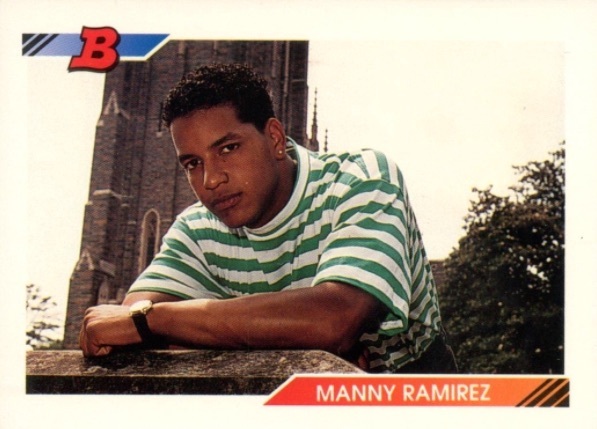 1992 Bowman features two famous Manny Ramirez rookie cards with him wearing a green-and-white striped shirt. The horizontal card is his first appearance on the checklist. It holds more value with collectors even though his second appearance was one of the 45 cards in '92 Bowman with a foil border and special finish. Because the 1992 set was so overproduced, both of the rookies are accessible to collectors at all budget levels, even mint copies.